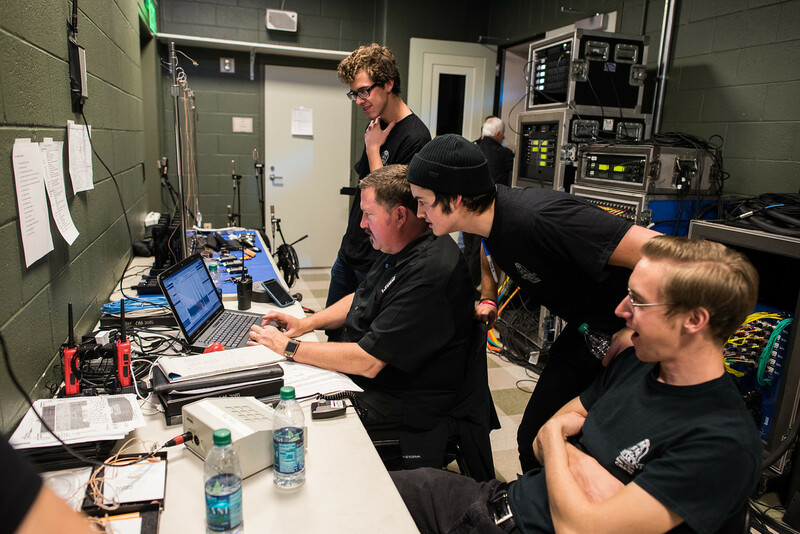 A glimpse behind the curtains of a nationally broadcast concert. 10 a.m. Staff members load the supplies no one thinks of but that everyone needs—first aid kits, jewelry, painter’s tape, sewing kit, safety pins, easels and foam core signage—into cars to take to Nashville’s stunning, 1,844-seat Laura Turner Concert Hall, the main venue of the Schermerhorn Symphony Center, for tomorrow night’s taping. 10:45 a.m. 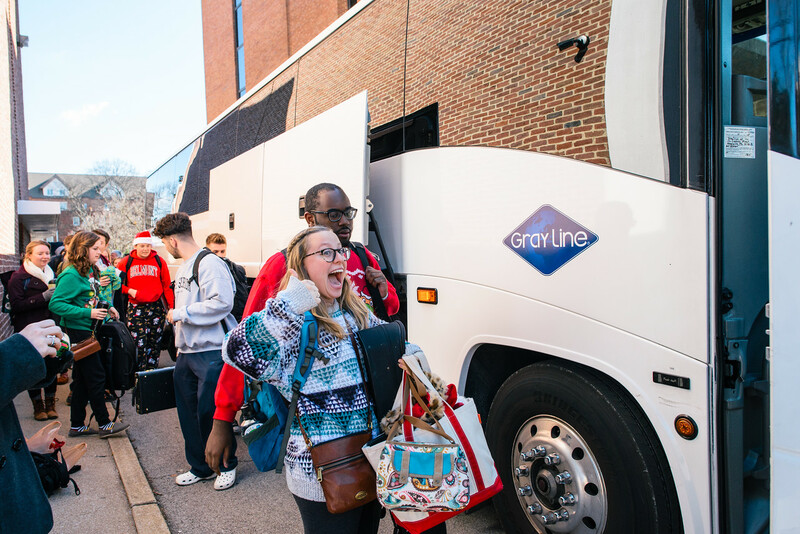 Buses begin arriving on campus, and nearly 200 students from musical theatre, the orchestra and jazz band load up for the short 10-minute drive to Schermerhorn, prepped for a long, long day of rehearsals… and waiting for rehearsals. 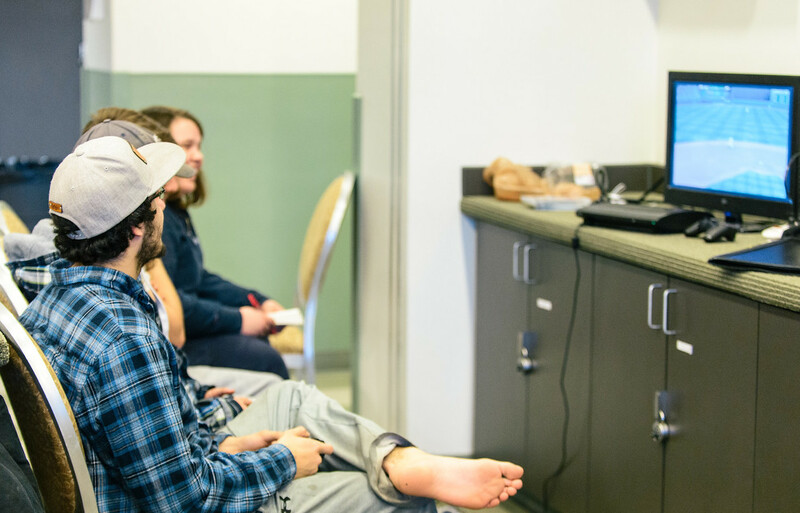 College of Visual and Performing Arts (CVPA) Dean Dr. Cynthia Curtis notes that the two days of rehearsal and the taped performance are the culmination of more than a year of planning and practice. 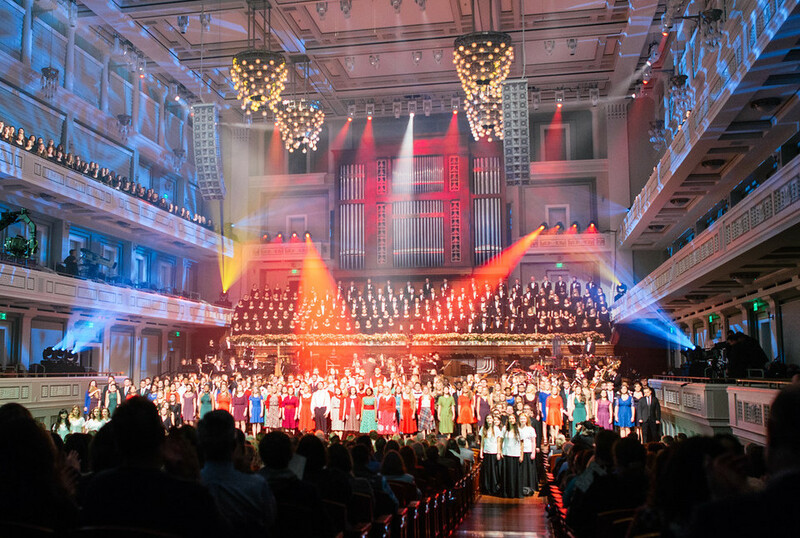 Contracts with Nashville Public Television (NPT) and the Schermerhorn are secured about a year in advance, and that’s generally when conversations begin with potential hosts. 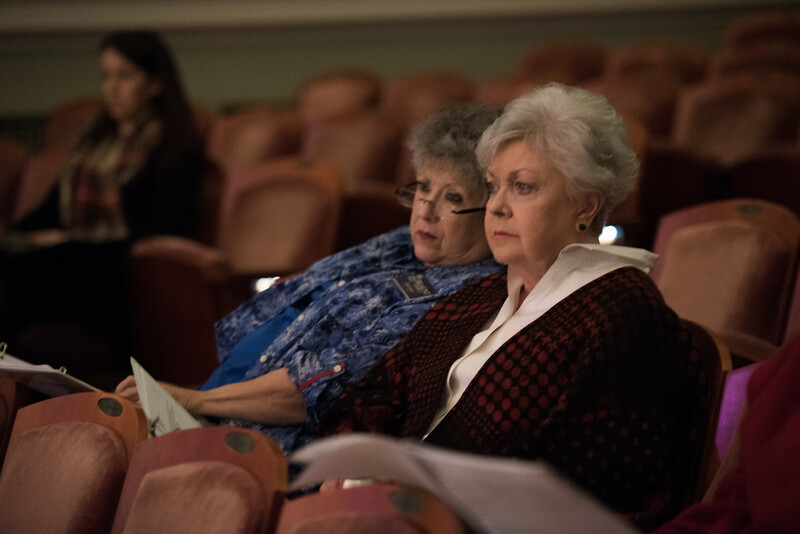 Ensemble directors spend the winter and early spring reviewing new material, and in May, they submit performance ideas to the “Christmas at Belmont” planning committee. 12:45 p.m. The Bluegrass ensemble, Chamber Singers, Chorale, Company, Jazzmin, Percussion, Phoenix, Session, Southbound, University Singers, Women’s Choir and 24—a total of 429 students—join their peers at the Schermerhorn, arriving in comfy clothes and carrying an array of activities—from homework to Playstations—to occupy their free time between practice sessions. ng with students warming up their instruments at every corner while dancers are stretching out their limbs and trying on costumes. Individual ensembles are rehearsing on stage while NPT adjusts sound and lighting. 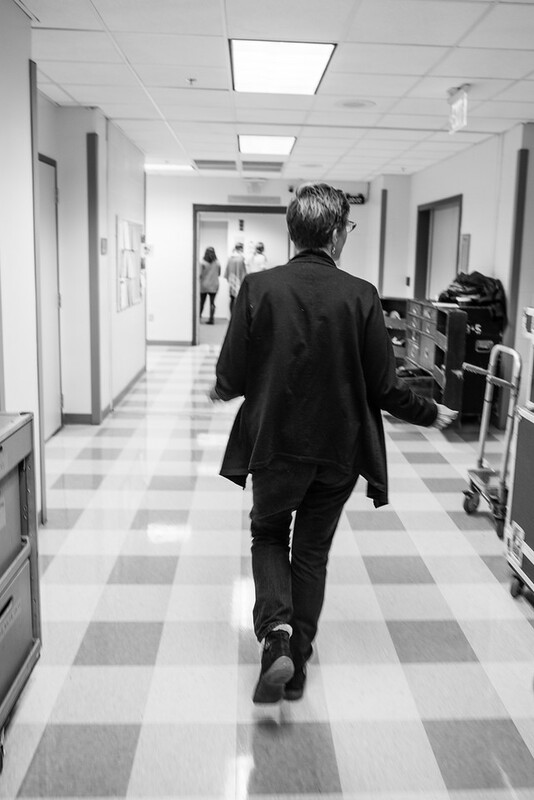 Sarah Davis, director of public relations and advancement for the College of Visual and Performing Arts (CVPA), quickly walks us through the maze backstage to see where the different ensembles are housed and to glimpse the technology at work to capture the best possible audio and visuals for the national PBS airing. already decking the halls with hairband antlers, Christmas-themed sweaters and even a couple of light-up Rudolph noses. 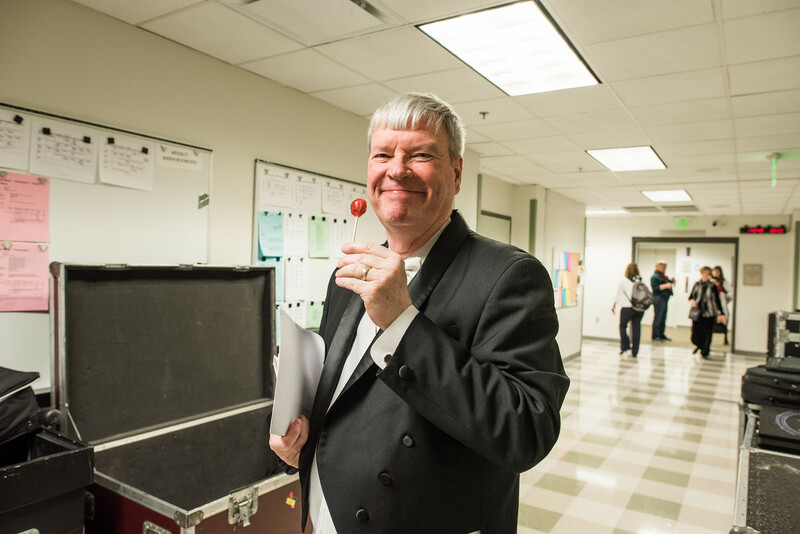 3 p.m. Running a few minutes behind schedule, the mass choirs and orchestra join host Kathy Mattea for a rehearsal of “Unto Us a Child Is Born” and “Celtic Joy,” led by Superman… also known as Director of Choral Activities and Associate Professor of Music Dr. Jeffery Ames. 3:20 p.m. Mattea rehearses “Mary Did You Know” with the orchestra, and the strings, harp and percussion beautifully fill the room in perfect accompaniment. 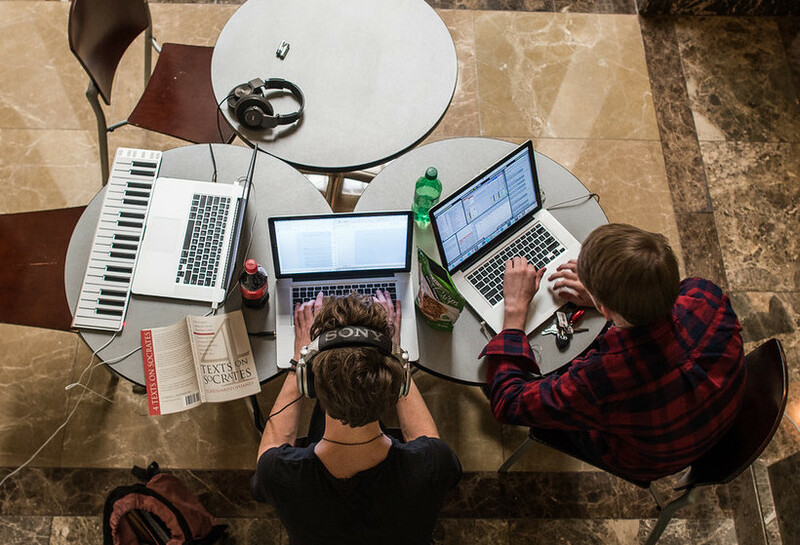 3:30 p.m. As rehearsals of individual ensemble pieces continue, students who aren’t needed on stage settle into their assigned rooms and nearby hallways. 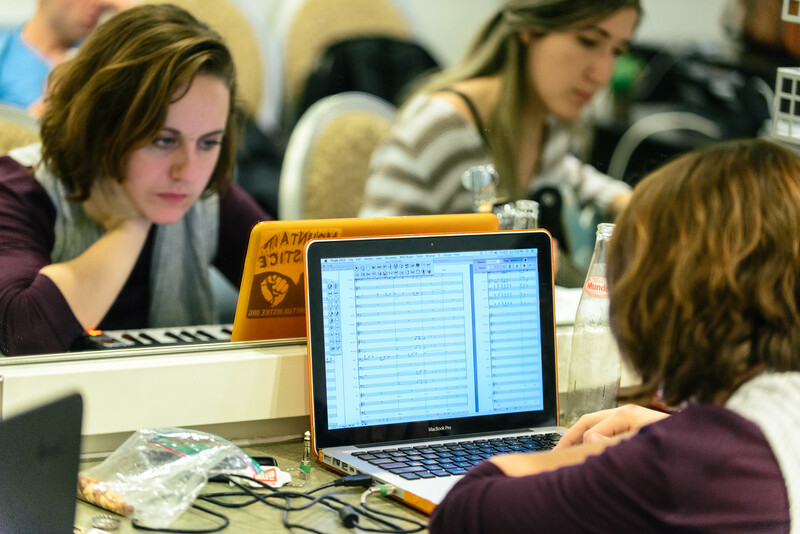 While the orchestra is on stage most of the day, other ensembles only appear to rehearse their specific songs and the mass choir performances. 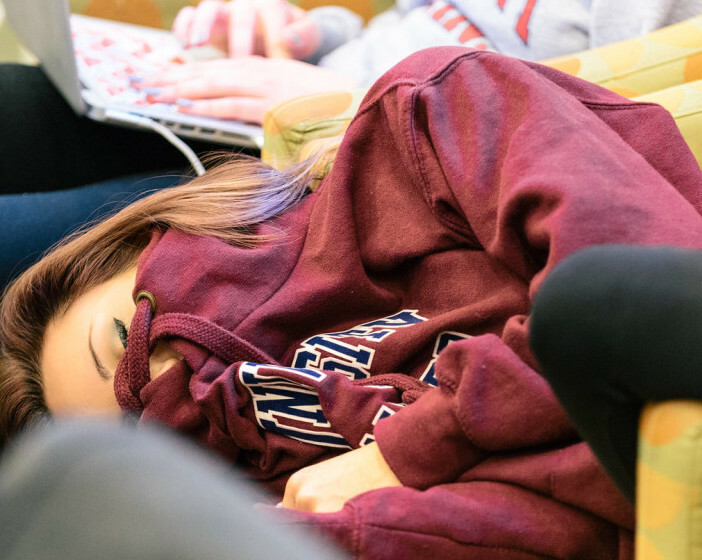 The rest of their time is filled hanging out in designated areas backstage, where they practice, play cards and video games, study and socialize… or better yet, catch a well-deserved nap! 4:30 p.m. Campus dining provider Sodexo arrives at the Schermerhorn to set-up for box dinners for the 700+ people on site. 7 p.m. 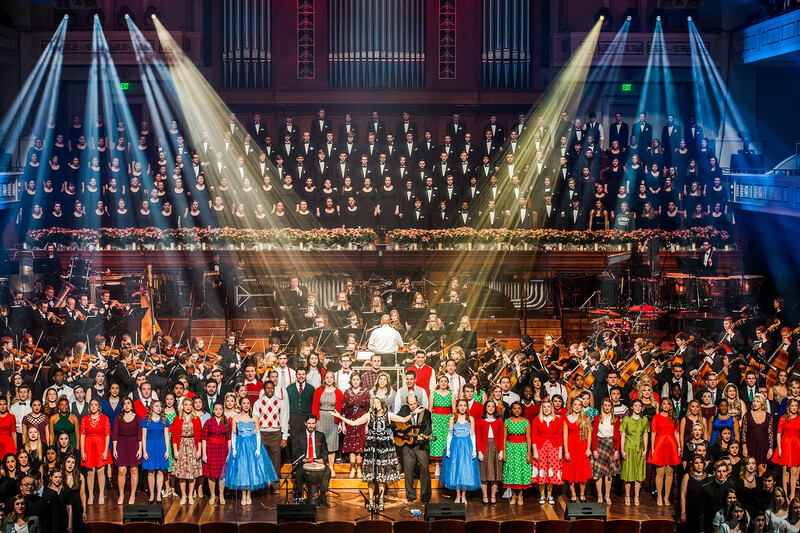 Final performance run-throughs include songs from the Nashville Children’s Choir, the Percussion Ensemble, 24 and Company. 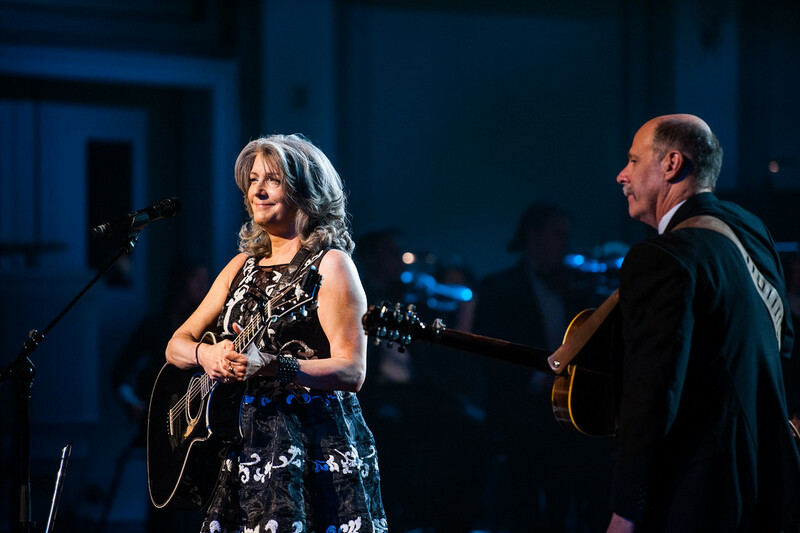 Meanwhile, in the lobby, an NPT camera crew films promotional spots with Kathy Mattea to help market the upcoming broadcast and inform the national viewing audience about all of the benefits of a Belmont education. 9:15 p.m. Lights fall as the entire cast starts the day’s final rehearsal, a run-through of the entire show from the top with lights and audio in place. 11:55 p.m. After a long day of rehearsals, cast and crew board buses to head back to campus, ready to tackle a full two-show day in a few mere hours. Monday, November 23: Show Day! 6:30 a.m. 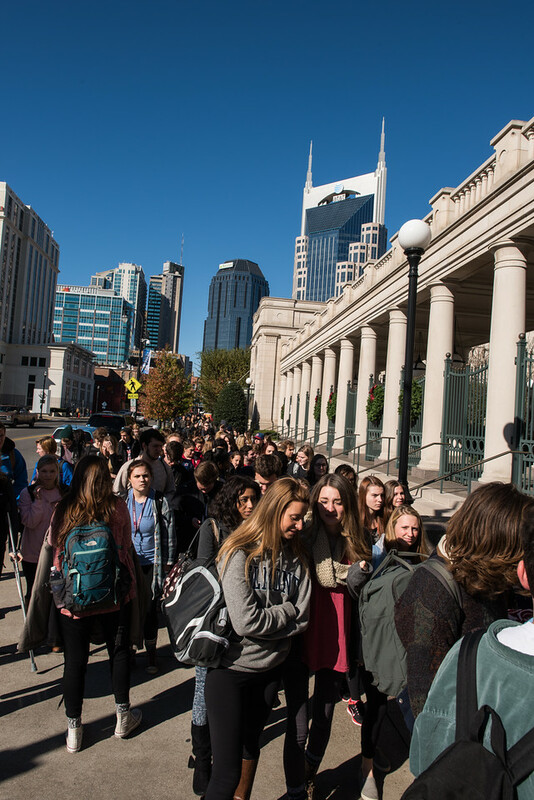 Despite limited sleep, School of Music crew members arrive on campus to carpool to the Schermerhorn. 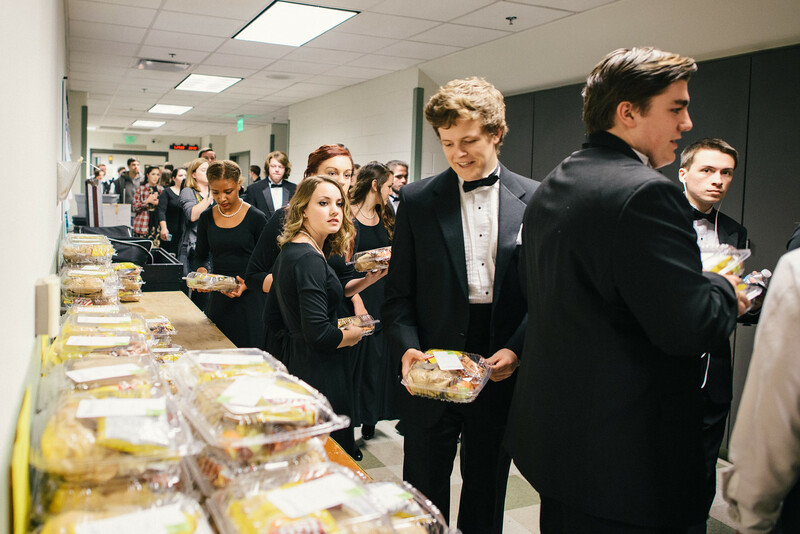 10 a.m. Six buses of students and staff depart campus so that several ensembles can pre-tape their performances. 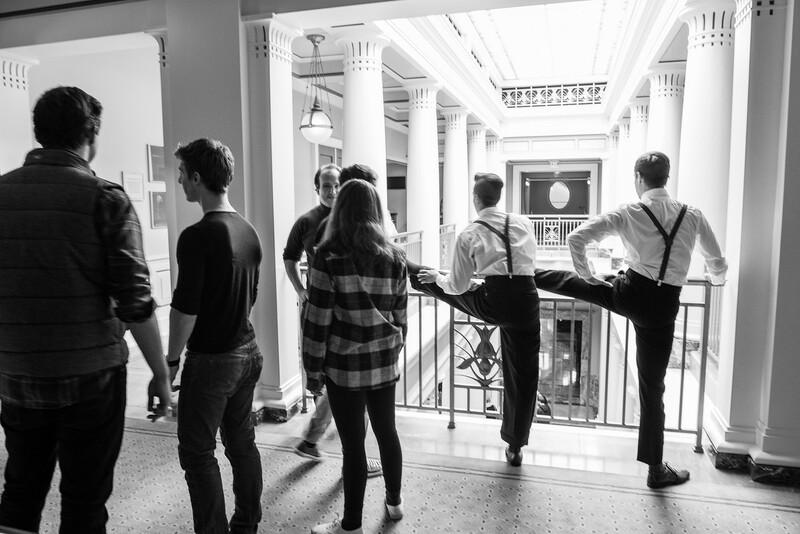 Another six will follow at 1 p.m. Everyone is dressed for the concert, though more than one student can be seen moving through the hall in stocking feet, saving the high heels for show time. 2 p.m. Final touches are completed as the mass choir practices the opening number and the finale. 3:28 p.m. Mattea and accompanist Bill Cooley return to the stage to perform “Mary Did You Know” with the Belmont Orchestra, an experience she calls “one of the thrills of her life.” Throughout the afternoon, the orchestra defies the “student musician” moniker, providing a beautiful and thoroughly professional backdrop to countless performances. 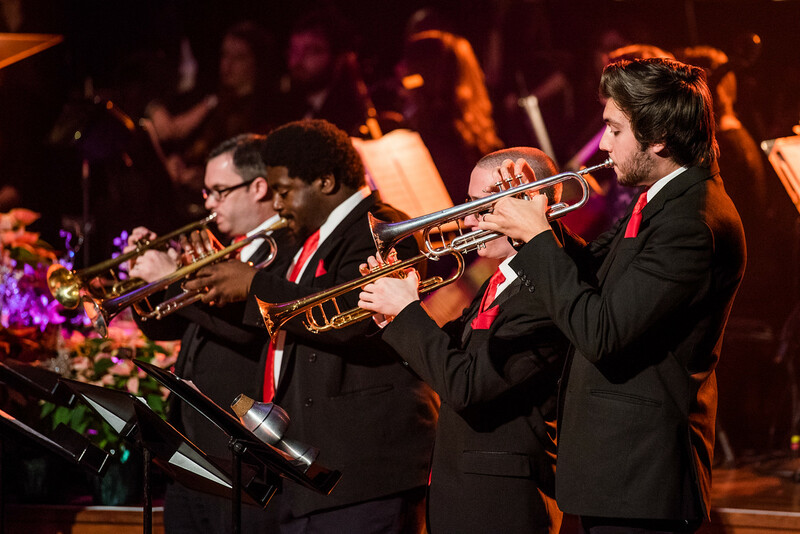 3:45 p.m. Belmont Strings take the stage, bringing contagious joy to an arrangement of Vivaldi’s “Winter” with their energetic and precise performance. 4:56 p.m. Thanks to a lovely medley from musical theatre, it’s likely that all three of their upcoming shows of “White Christmas” will be sold out. 5:25 p.m. It’s a wrap!… But only on the dress rehearsal. There’s still the main show yet to go, but confidence is high after such a smooth and complete performance. 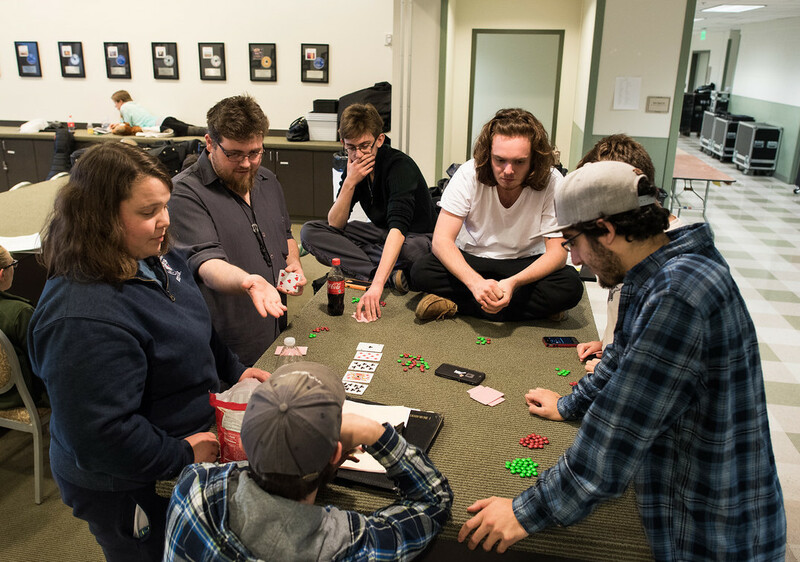 Ensembles return to their holding rooms to eat dinner, while their directors meet with Mattea and School of Music staffers to dissect the show and make any needed last-minute adjustments. 6:15 p.m. Ensembles freshen up and prepare for the 7:30 p.m. concert, as doors open and ushers begin seating for the taping. 7:05 p.m. Belmont President Dr. Bob Fisher welcomes the audience to the Schermerhorn Symphony Center. 7:15 p.m. The cast is called to top of show places as seat fillers are placed in any seats that have yet to be occupied. 7:20 p.m. 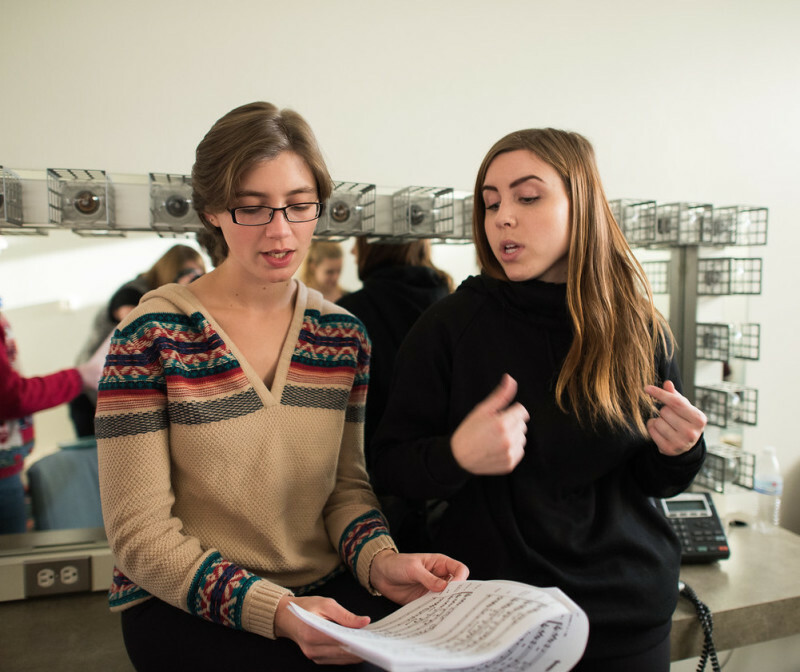 Backstage between performances, Mattea is surprised by a dozen-plus members of Phi Mu Alpha Sinfonia – an American collegiate social fraternity for men with a special interest in music. The guys charm the host by serenading her with one of their fraternity’s songs, appropriately titled “A Serenade to a Girl,” in gratitude for all of Mattea’s contributions to the weekend. 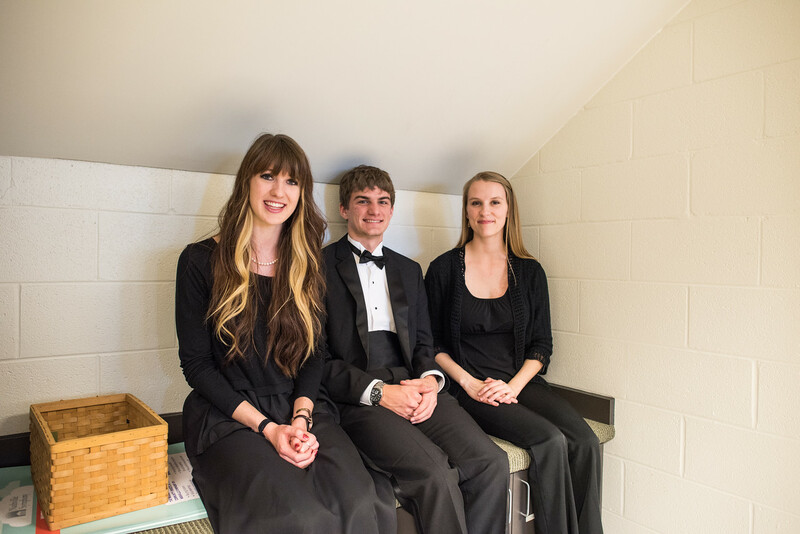 7:25 p.m. Stand-by to begin — From the truck, NPT cues the stage manager to send out the concert master to tune the orchestra for the start of the show, and the show begins a few moments later, with another excellent performance from all involved. 10 p.m. After two lengthy days, the load-out of Belmont equipment and decorations begin as students and faculty gather their belongings to board buses back to campus. 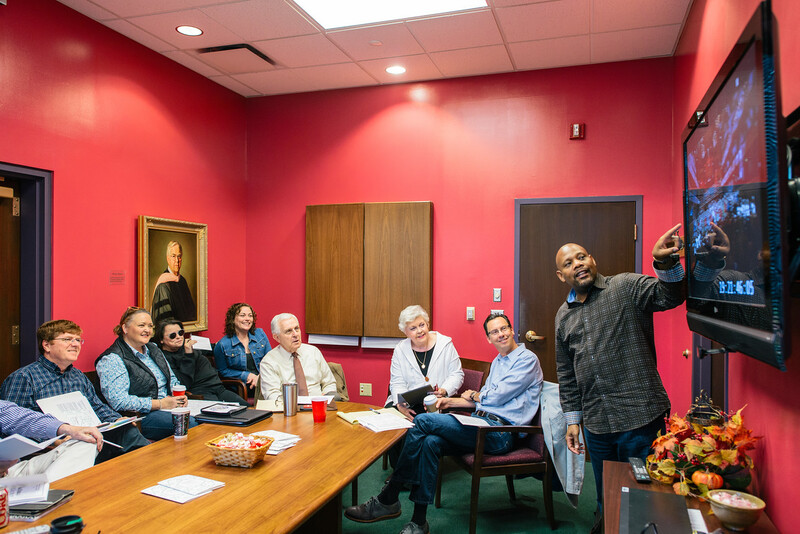 9 a.m. And still, we’re not quite finished… Key personnel from School of Music and consultants from across campus gather with NPT representatives to review a raw DVD of last night’s performance to make final decisions on what makes it on air for the national PBS broadcast. 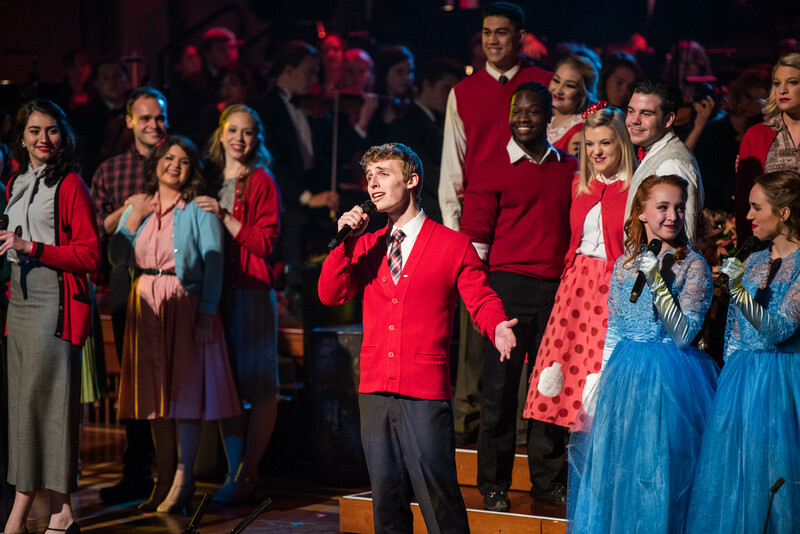 Running on little sleep, this committee faces a full day trying to choose the best combination of songs from another spectacular “Christmas at Belmont” concert. 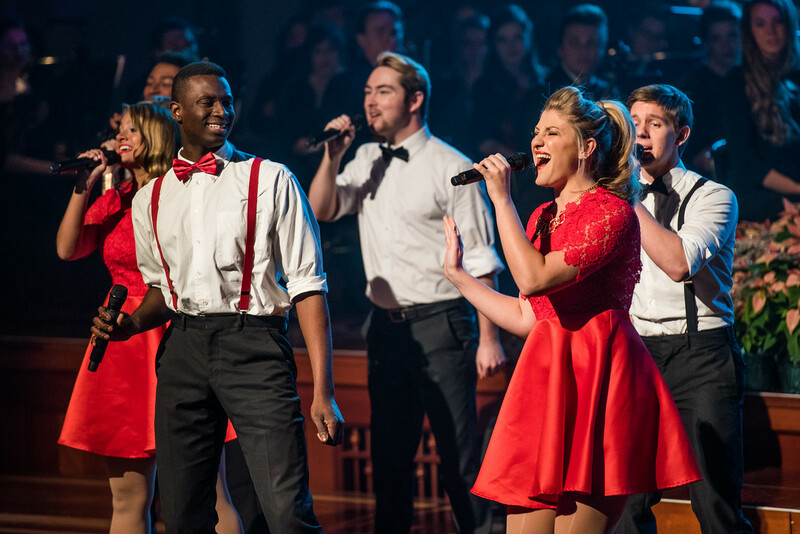 “Christmas at Belmont” is scheduled to air nationally on PBS Dec. 21 and 24. Check local listings for air times in your area.